This is what is known as man spreading. The empty seat or half empty seat beside him might have welcomed the woman standing on the right, but in his present pose I don't suppose she would want to try invading his space. 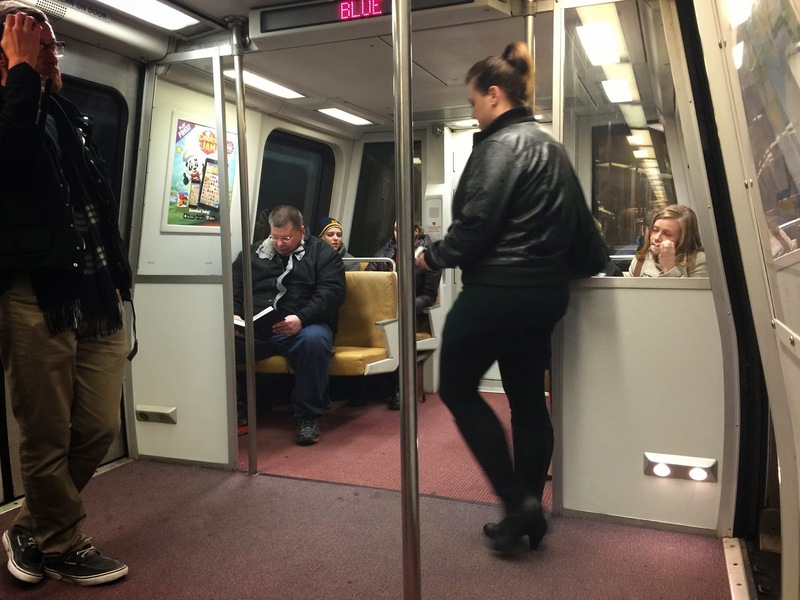 Woman spreading also occurs on Washington's Metro: women too large to fit comfortably in one seat or women with too many packages who don't want to share. Why harp on petty things when Metro management can't seem to get its signals (all kinds) straight. When riders must now wonder every time they board a train what mishap or worse might occur. Regarding the smoke fatality: Didn't anyone think that inhalation in the cars might be dangerous and mandate emergency measures as soon as possible? Doesn't Metro want to own up as quickly as possible to its relations with the DC Fire Department who, in last reports, delayed evacuation due to poor coordination of information on whether 3d rail circuit turned off? Didn't someone (who?) need to tell firemen that another rail line was operating safely and to ignore it? Where is Mayor Bowser in this? Why isn't she being more outspoken about the service problems of Metro? How many members of the Metro board ride trains or buses?